This is a new recipe idea for using leftover fresh cooked vegetables. Combining and saving small amounts of veggies is a long time practice of mine. Normally, leftover veggies go into an airtight container to be used later in the week. Oftentimes these end up in a casserole or goulash style dish. 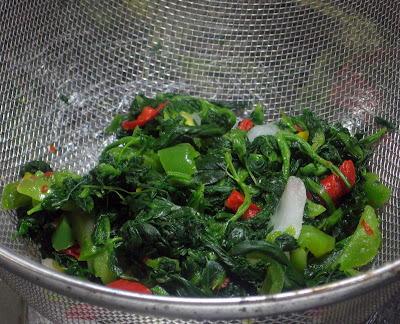 Cooked fresh veggies, especially peppers, don’t keep as well as the frozen variety for me. It seems the fresh cooked vegetables, particularly bell peppers, softens more quickly, and as such store separately. According to my palate, both the flavor and body of the vegetable diminishes. Moreover, the fridge is crowded with mini storage containers, very annoying. The leftover bell pepper dilemma combined with stuffed pork loin extreme family enjoyment, inspired this veggie and rice stuffing. Saute Leftover Spinach, Bell Peppers, and Onion in Olive Oil. Sprinkle with salt and pepper. 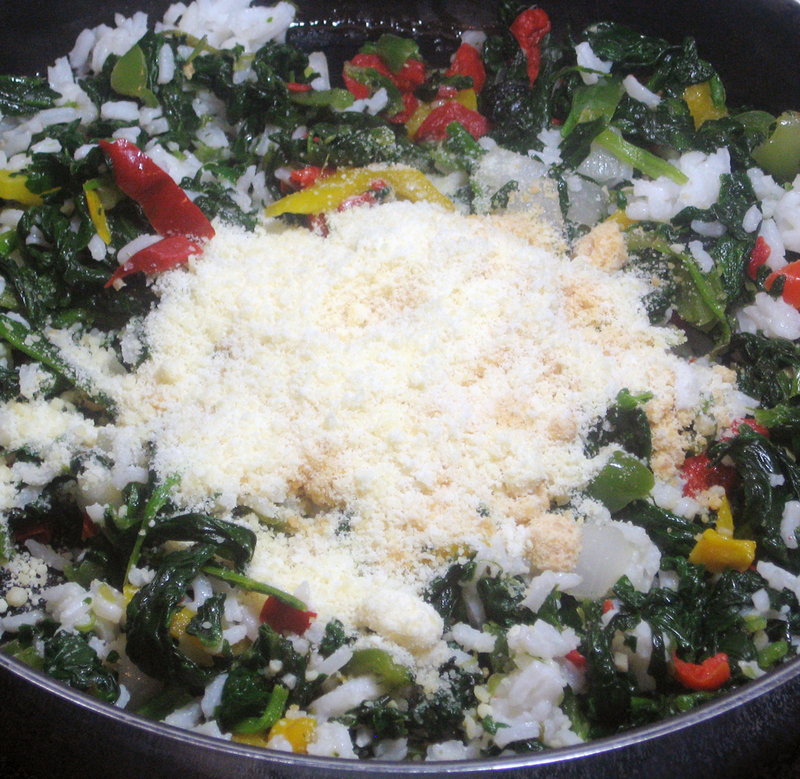 Stir in the minced garlic and leftover rice, cooking until heated through. Add in the cheese and stir until cheese begins to melt and is blended. Stuff into pork loin, chicken, or chops. Sorry, no photos of the finished meal as the guys far were too hungry to wait for a shoot. This stuffing recipe was enough to fill a 3.5 pound pork loin and served four adults. The following video is the method used for stuffing the loin. If you don't watch the video one tip I learned to follow, leave free a one inch boarder around the meat because the stuffing does expand when rolling. The flavor was excellent, much different from the spinach stuffing we traditionally enjoy. 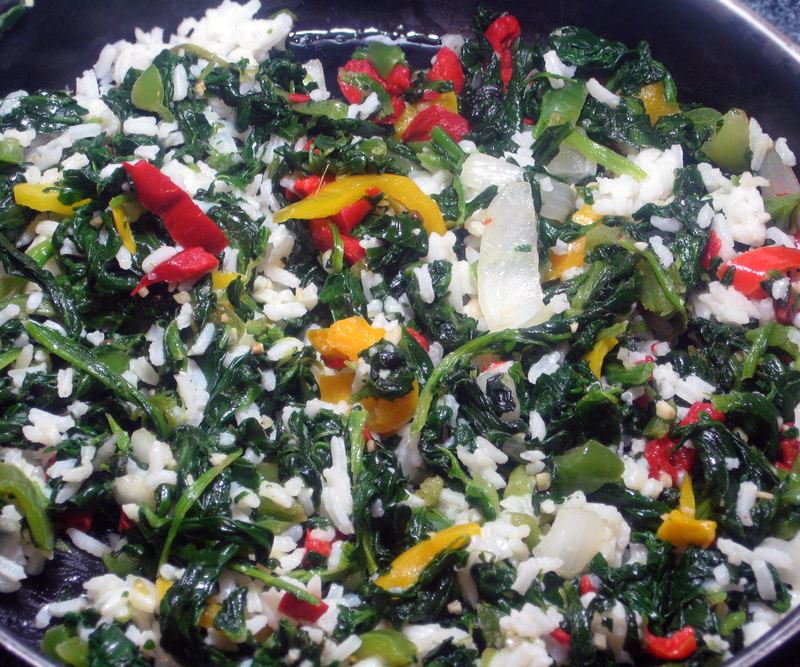 The bell peppers and full bodied olive oil added a new dimension of flavor. The rice absorbed the rosemary seasoned pork flavor, delivering what hubby describes as gourmet flavor. 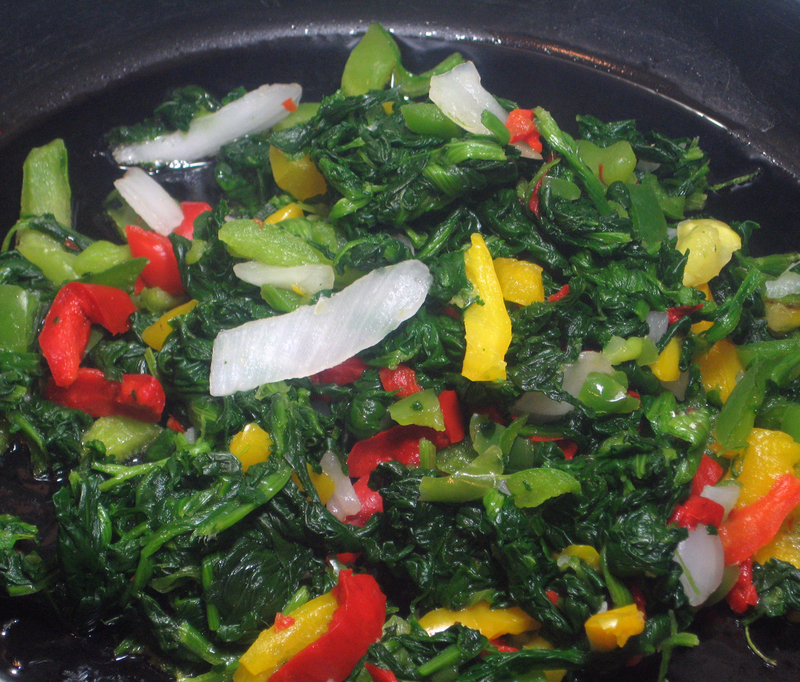 Not only is this a great option for leftover veggies but also a fine way to eat more greens!